For many, running and racing isn’t just a hobby, it’s not just a healthy habit, it’s something more than that. People run for a number of reasons, a number of motivations, a number of causes. Sure, people race for themselves, but they also race for others. I Race For Cause (IR4C) is a community based on that concept. The premise is simple, and because racing for a cause is grounded in fundraising, IR4C is a destination – essentially a third party – for racers and sponsors to come together in support of noble causes. It’s an online community to unite runners and funders under their specific cause or charity umbrella. Runners designate what they’re racing for, and IR4C matches up donors from corporate America who support that cause. Built on a strong foundation of the driving force of motivation behind the everyday athlete, IR4C says it’s about empowerment. “Empowering the everyday athlete with the tools to make a difference and change the world.” While elite athletes gain endorsements and support from major sponsors, IR4C is giving the everyday athlete a stake in that contribution, too. Why should the pros be the only ones credited with corporate sponsorships? There are too many everyday athletes out there, working hard for what they believe in. IR4C is not only acknowledging that, but bringing it to the forefront and giving everyday athletes a voice. It’s that simple. 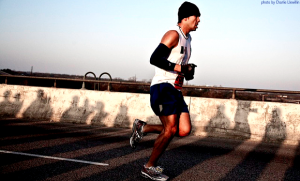 The online community is paving the way for everyday athletes to tie a cause to their passion. Then, their passions are supported financially through the sponsorships IR4C has, and continues to garner. It’s easy to sign up, create a profile, log your training and racing goals, and start raising money for the cause you stand for. “The voice in your head that says you can’t do this is a liar,” IR4C says. And they’re proving it day by day. With a constant influx of new members, the community is growing rapidly, blowing up with everyday athletes and sponsors alike. Like any social media website, members of the community are encouraged to share their stories within the IR4C world. IR4C begs the question, “what better reason to race than for something bigger than yourself?” With a community of like-minded everyday athletes to support each other and a sure-fire way to build donations for the cause or charity they believe in, IR4C is revolutionizing the way athletes fundraise their efforts. Now, they have more time to train, increase their endurance, and the funds skyrocket as a result. Win-win… win!